Lennoxtown is located at the foot of the Campsie fells and is a town that started to prosper due to its cotton industry, as well as being the town where Charles Mackintosh established his chemical works factory before going on to develop the well-known waterproof jackets that bear his name. Lennoxtown was the birthplace of famous singer Lulu and now has famous football playing residents in its state of the art training ground that is home to Celtic F.C., who work with the local community to allow schools to make use of their prestigious facilities on certain occasions. Lennoxtown is also home to Scotland’s premier Schoenstat Centre, which is a spiritual retreat and conference venue. Two of Lennoxtown’s most notable historical buildings that were designed by Glaswegian architect David Hamilton have unfortunately both been destroyed by fire. Campsie High Kirk, an 1828 Gothic-style structure was obliterated by flames in the 1980s and lies ruined today, whilst Lennox Castle, built in 1841 and used as a maternity hospital after being sold in 1927, met the same fate in 2008. Lennoxtown is definitely a place where you can enjoy a lot of peace and quiet, but it also has a lot going on beneath its tranquil veneer. 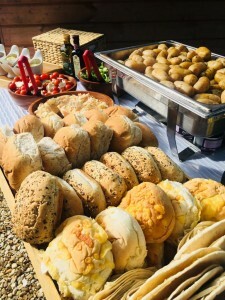 Having spent a lot of time catering for events here, the Hog Roast Lennoxtown team recognise the importance of not just providing our usual standard of excellent food, but also adapting our style of service to suit the tone of your event. Our sociable Chefs love nothing more than being the centre of attention and cooking everything from scratch in front of all your guests and of course, our mighty hog roast machines are always a great focal point for the evening. The sight and smell of our superior hog roasts cooking and our catering team showing off their skills is always guaranteed to get everyone in the party mood if you have a large, fun-filled event in mind. However, we are experienced enough to know that certain events which are more formal in nature require a more understated style of service and interaction with the guests, and the Hog Roast Lennoxtown team are just as adept at catering discreetly on the side lines if that is what you require. Whether you are planning a peaceful party or an upbeat gathering, Hog Roast Lennoxtown always hit the mark with our appropriate and professional style of service.